After spending around five hours in a fun bilingual bubble in a London business school, I was back on the tube again, ready for another magical mystery tour (i.e. I randomly got off somewhere that sounded exciting) Throughout the morning and afternoon, I had met some really fun people – including an awesome girl who bonded with me over French camp sites, Dinard airport (read my very first ever blogpost for an insight into the Dinard airport experience!) and… disney princess impressions. 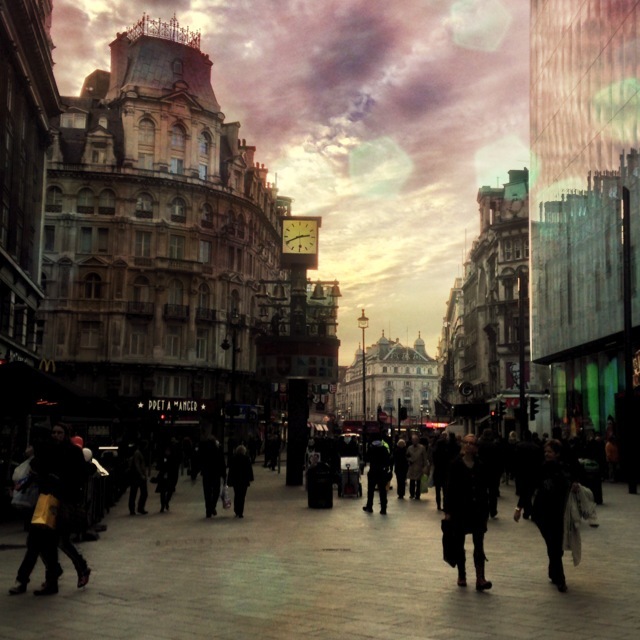 Everyone I met had a lot of tips and tricks on what to see and do in London – including where to buy tickets for shows. In fact, the subject of shows and musicals was a great ice breaker and sparked up some lively debate on the best shows to see in London. After saying goodbye and exchanging numbers with my newfound friends, my first idea was to go and see the ‘half price’ musical ticket booths around Piccadilly Circus to see if I could score any last minute matinee deals – however, at over sixty pounds for an average restricted seat, I wasn’t sold…. Yet. Better deals were to be had later in the week! As with any city, the London skyline has an interesting fusion of architectural styles! Glass edifices and older buildings from the 1800-1900s nestle together side by side in Leicester Square. After a couple of minutes spent gazing at rooftops, I made my way to Gerrard Street in Soho. 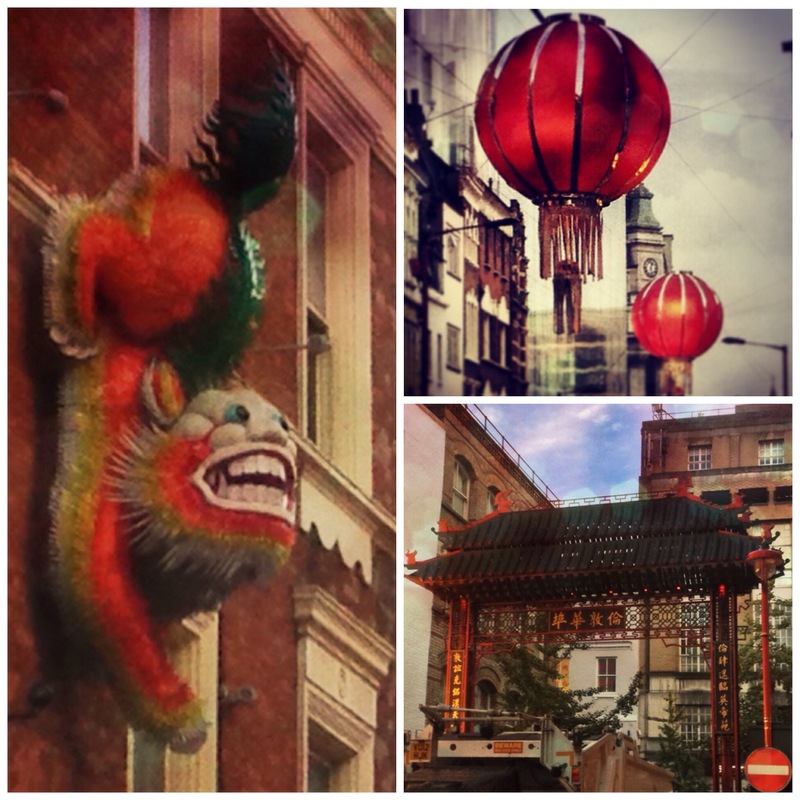 Gerrard Street is home to Chinatown, which is only about a minute away from Leicester Square by foot but definitely feels a world away in terms of look and ambience. 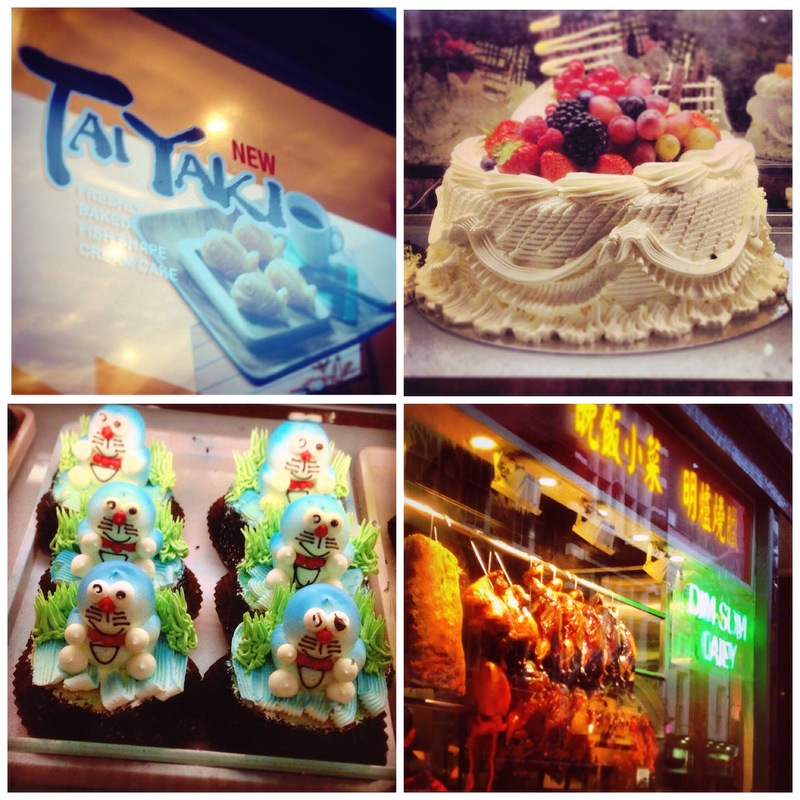 A delicious and odorous combination of spices, meats and sweet treats permeates Gerrard Street. Enthusiastic personnel wait outside their respective businesses in an attempt to entice the passer by to take a seat and indulge in a heady mix of herbal teas, peking duck, sumptuous cakes and… cuttlefish. I was intrigued by the window displays food along the street, displays which often had one or two ‘casual cuttlefish’, tentacles and all hidden amongst a throng of Peking Duck. I wasn’t hungry, thanks to McDonalds – shame on me for not holding out on my hunger and embracing an opportunity to try something different. My parents visited Chinatown for a meal earlier this year and told me before my visit that the food there is incredible – £20.00 per head will guarantee you an impressive, tasty and unique meal in the heart of London. Next time I go to London, a visit to Chinatown is definitely on the cards… however I might give the cuttlefish a miss. Not a fan of those tentacles! See if you can spot the cuttlefish in my picture below… The character of Dr. Zoidberg from Futurama springs to mind. Taiyaki (top left image) is a little waffle or pancake batter cake which is shaped like a fish – the literal translation of the japanese word ‘Taiyaki’ means baked sea bream. However, the design is misleading (… is it too cheeky to refer to it as being a red herring?) for the cakes are not fishy in the slightest, being filled with cream and intended to be a sweet pastry accompaniment to coffee! From what I recall, it was around £1.50 for four or five cakes, so definitely a bargain. I was really impressed by the ornate icing which was piped on to the Chinatown cakes and cupcakes – it’s wishful thinking to hope that all the berries cancel out all the calories from the icing, right? Bottom right, you can see ‘Doraemon’ cupcakes. Doraemon is a blue futuristic robotic cat from a Japanese manga which dates back to 1969. In the bakery windows, Doraemon was a figure that cropped up often as a cupcake topper, only rivalled in number by his popular pal Hello Kitty. 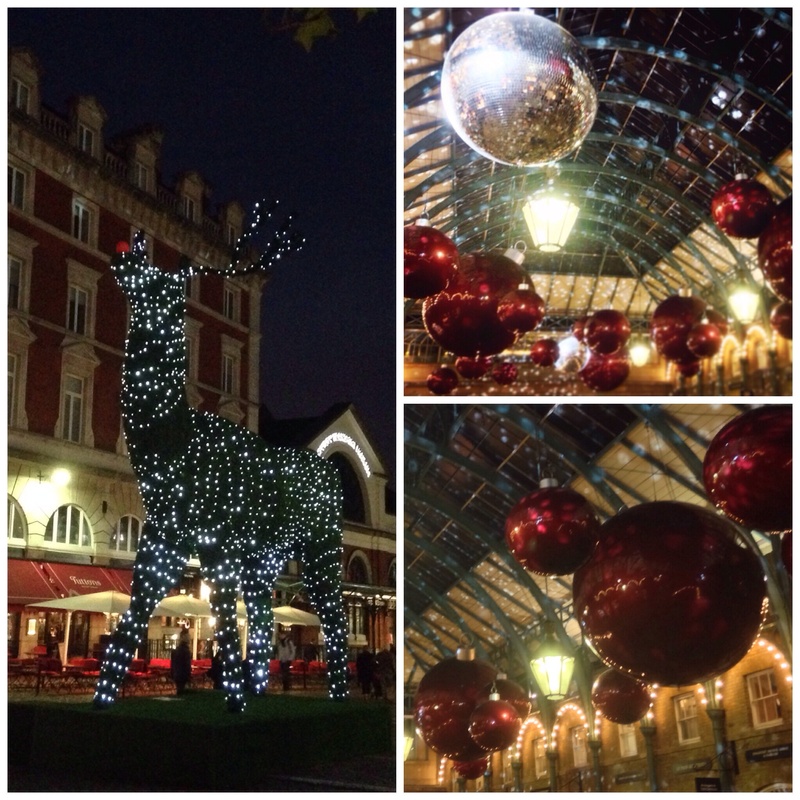 I did not succumb to iced temptation, but headed back to Covent Garden to gaze some more at the indoor market shops and beautiful christmas lights – I especially enjoyed the 15ft topiary reindeer placed outside the market. 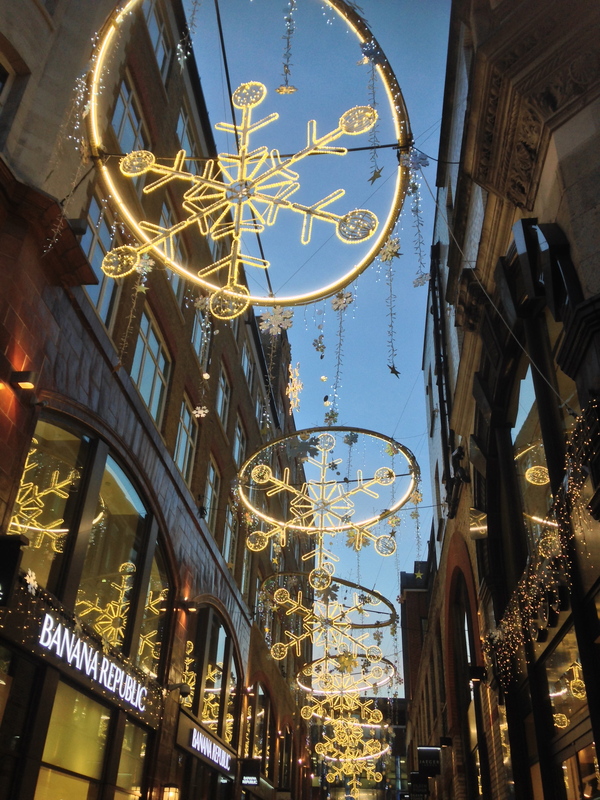 Giant baubles adorned the inside of the Piazza, glittering and glinting magically like disco balls in the evening lamplight. I felt a little bit like one of the Borrowers. After Covent Garden, I met up with Ollie and his girlfriend Lucy to check out a Blues Bar behind Hamleys toyshop called “Ain’t Nothin’ But The Blues” – it’s an intimate venue with cool blues and overpriced nachos – we listened to the live music and had a drink. We decided to refrain from buying nachos*, instead we found some food round the corner at a takeout noodle bar called (rather questionably) “Wok to Walk”. We had a few jokes over the name – do you really want savoury noodles on your morning commute? There is also a noodle bar in Durham, our old univerisity town called “Woksup” – it seems to be a running theme or trend for noodle bars to have puns in their name. The noodles from “Wok to Walk” were great though, and I had a lot of leftovers thanks to the portion sizes being so generous. After saying our goodbyes, I was even stopped by a woman boarding my train back to Croydon who found the pun on the noodle box amusing… I guess the marketing ploy worked! On the journey back to Croydon, my thoughts were full of daydreams of Chinatown – I’m already looking forward to a return visit sometime in the future!